Click to viewIt's always sad when a store you used to frequent goes out of business, but how about when that store used to mark up its prices like mad? Things become slightly less sad. 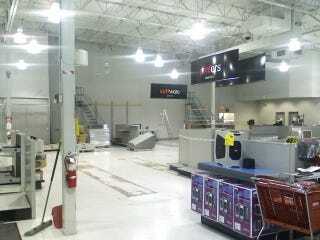 Nevertheless, this desolate scene at a Portland CompUSA definitely brings a slight tear to our eye. Reader Russ went in for some "last gasp" deals, but there's pretty much nothing left, aisles and displays having been long torn down. He tells us that if there's a store closing near you, you might be able to nab 40% off some Xbox or PSP games as well. Bonus shot after the jump.